Actor Keanu Reeves stars in Exposed, which was originally conceived as an independent film about a Dominican family called Daughter of God. The film was recut from a serious, mostly Spanish-language drama with black and Latino characters to an English-language thriller starring Reeves. In a world where people are taking to the streets, saying “Black lives matter”—where TV shows and films like Empire, Selma, Jane the Virgin, Straight Outta Compton, Fresh Off the Boat and Black-ish are getting high ratings and winning awards—one movie studio allegedly said no to all that diversity and instead chose to take us back to a “simpler” time when all your intimate black and brown dramas were instead predominantly white, bland vehicles for stars like Keanu Reeves. That studio is Lionsgate. The film is Daughter of God. And the accusation is whitewashing. An indie drama by a Jamaican-American first-time director, Gee Malik Linton, Daughter of God was supposed to be a quiet, surreal story about a Latina woman and the Dominican family she lives with, featuring subplots about violence against women and the twin effects of mass incarceration and police brutality on black and Latino communities. But now, because of drastic changes in the film’s edit, Daughter of God has become Exposed, a generic, middling thriller debuting this January and starring Reeves. Large subplots involving Latino and black characters have been cut, and the trailer features predominantly white faces. Linton, who also wrote Daughter of God, sued to have his name removed from the project—which now, according to IMDb, has been directed by a “Declan Dale.” While Linton did not comment on the apparent whitewashing of his film, a number of people directly involved did speak to The Root about what Lionsgate did. “[We went] from a masterpiece to ‘here we go again,’ taking away the pure reality of the story, the core. 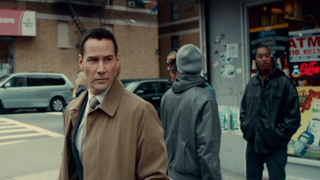 Taking away everything because of Keanu Reeves, because he could sell more with his face,” said Gabriel Lopez, who acted in the film and is a native of New York City’s diverse Washington Heights neighborhood, where much of the movie was shot. Lopez accused Lionsgate of being a “culture vulture,” of using the neighborhood and its people for the film, but not staying true to the film’s original vision, which he said was about highlighting Dominican-American culture. According to Downie and others interviewed, before it became Exposed, more than half of Daughter of God was originally in Spanish and was a starring vehicle for Cuban actress Ana de Armas, whom Reeves recommended for the role. The film also heavily featured Big Daddy Kane, Gabe Vargas and Orange Is the New Black’s Laura Gómez. Reeves’ part—that of a white police officer investigating his partner’s murder—was supposed to be a smaller, supporting role, originally intended for Oscar-winning actor Philip Seymour Hoffman, who died in February 2014. Those who worked on the film described the role as the kind of part that bigger, A-list actors take in order to help a small, independent film like Daughter of God get funding. But Reeves’ involvement apparently came at a price, and that price was the integrity of the film once Lionsgate got involved. Downie believes that during the process of getting Lionsgate to come to the table with funding, the studio was told one thing about the film—that it was a crime-thriller—when it was actually something else—a bilingual, multiracial drama—creating what Downie called a “hodgepodge” deal with Lionsgate. A director’s cut by famed film editor Hervé de Luze was made and shown in France, where, Downie said, more than 80 percent of the audience rated the film positively, but when the studio saw this version, it balked. Lionsgate would end up recutting the film to fit what it thought it had been sold: a Keanu Reeves crime-thriller. I have seen both cuts of Daughter of God/Exposed—the Hervé de Luze cut and the studio’s version—and the differences are stark. The studio cut of the film slices and dices away the lines and scenes featuring black and Latino characters, removing huge chunks of the Dominican family’s life in Washington Heights. Cut by more than 20 minutes, the once dreamy-but-haunting, female-centered drama is turned into a disjointed thriller with few thrills. Some characters’ parts are almost cut entirely, diminishing the effect of the final twist of the film and causing it to fall flat. And the impact of a subplot about police corruption and brutality is diluted to make more time for Reeves to brood, an attempt to pad out what was intended as a thin role. In the trailer, the cuts are even more misleading. Only one of the Latina actresses is featured—star Ana de Armas—and she's reduced to a bit player. The Dominican family doesn't appear at all. The rest is scene after scene with Reeves, Mira Sorvino and other white members of the cast, with a few menacing cuts to Big Daddy Kane, presented as Reeves’ primary adversary, when his role is a bit different in the film. The surreal elements that mark the movie aren’t there; nor are many of the black and brown faces who make up the primary cast. Several of those who worked on the project said that people of color need to own their own projects in order to ensure that whitewashing does not take place. Downie pointed to the success of TV shows like Power and Empire and how, despite their popularity, they have not affected the mentality of the film industry. Editor’s note: The Root reached out to Lionsgate for comment but had not heard from the studio as of the time of publication.